There is no more soul-warming cocktail on a cold day than Hot Buttered Rum. 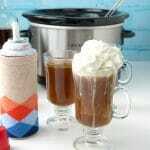 This version is made in the slow cooker and takes about 5 minutes to get started. Your house will smell like the holidays and the buttery drink isn't over sweet, but rather 'just right'. Setting up a self-serve drink bar allows making the cocktail to taste; adding just the right amount of rum, whipped cream and nutmeg, or drinking it without liquor using rum extract or on its own. Add all ingredients to the slow cooker EXCEPT the rum, whipping cream and nutmeg (those will be added individually to serving mugs). Cook on LOW for 5 ½ hours (may be kept warm in the slow cooker after completing the initial cooking). Strain the mixture through a fine sieve to remove loose spices and any butter solids; return to the slow cooker to keep warm. To serve: Pour rum (or rum extract) to suit individual mugs. Top with whipping cream and freshly grated nutmeg. Note: the sweet spiced buttery mixture from the slow cooker is wonderful on it's own too; for those who prefer it without the rum flavor and alcohol, it can be consumed as is.